After another 6 years off with the birth of our first kid, we were bitten by the sailing bug again. 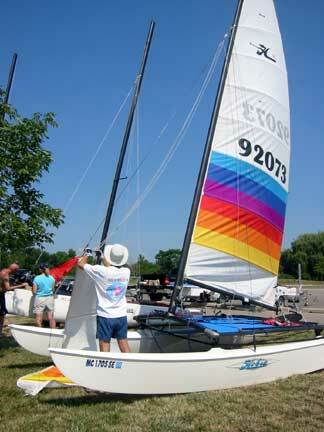 We found a pristine 1988 Hobie 16 for sale that we snatched up. 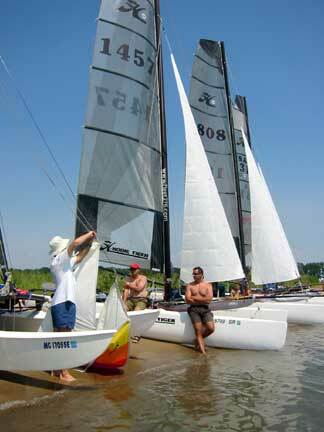 The boat had been used for racing at one point, so had many of the "go fast" goodies already installed, and came with two decent set of sails (including a mylar set). 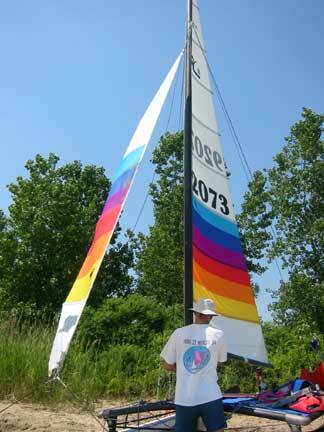 We hooked up with Hobie Fleet 276 (Detroit) for our first real outing of the summer. This was a sail from Metro Beach over to Gull Island, which is about a 5.5 mile sail (one direction) as the crow flies. Gull Island is a popular destination for the cruising and partying group in Lake St. Clair, with a sandy beach with shallow water on the south side of the island. It is just on the boarder with Canada at the mouth of the St. Clair River, so you need to watch for shipping traffic. 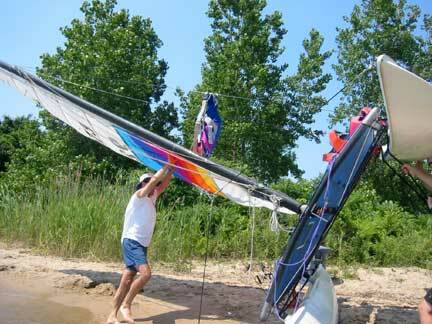 This picture taken at Metro Beach setting up the boat. It was a beautiful day for sailing. Of course, it wouldn't be right if we didn't break something while out. In this case, the jib halyard decided to let go about half way over to Gull Island. This picture taken at Gull Island after removing the broken end of the halyard. We were the only 16 to go on this trip. 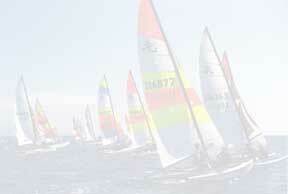 There were 3 Hobie Tigers, which with their asymmetrical spinnaker make the 16 look like a slug going down wind. 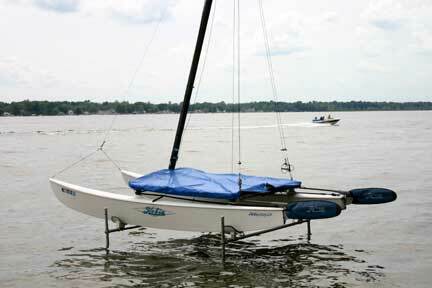 Our boat spent the summer on a home-made hoist on Wampler's Lake in the Irish Hills.